This is the tale of two husbands – one who faithlessly abandoned his wife, leaving her to walk alone through the valley of the shadow of death; the other who was faithful to the vow he made before God and man to stand fast by his wife in sickness and in health. The first tale appeared in People magazine a fortnight ago. The second tale appeared in the book “Mortal Lessons: Notes on the Art of Surgery,” which was written in 1976 by Dr. Richard Selzer, a Christ follower who also happened to be a Yale-trained surgeon. The beautiful 27-year-old woman was sitting by a campfire cooking tuna steak and asparagus. Her husband of two months got up to relight the fire. He swung a can of gas and some of it inadvertently splashed on his wife. Before she knew it, she was engulfed in flames. The young wife screamed bloody murder. “I thought I was dying,” she recalled. By the grace of God, she survived. But she sustained fourth-degree burns on her face and third-degree burns on her hands, legs feet. “I felt every inch of my flesh burning off that night,” she said. Indeed, had an ambulance arrived a minute later than it did, she surely would have died. Instead, she was in the hospital for 51 days, 41 of which she spent in the intensive care unit, including 30 days in an induced coma. When the young wife finally awakened, when she finally was able to leave the hospital, she went home to her husband and five-year old daughter. But a mere two weeks after she returned to her family, the husband who promised to stay by his wife’s side for better of for worse told her he was leaving her. “He told me,” she said, “he couldn’t handle or deal with me any longer.” And off he went. “I stand by the bed,” he recounted, “where a young woman lies, her face post-operative, her mouth twisted in palsy, clownish. A tiny twig of the facial nerve, the one to the muscles of the mouth has been severed. She will be thus from now on. The surgeon had followed with religious fervor the curve of her flesh; I promise you that. Nonetheless, to remove the tumor in her cheek, I had to cut that little nerve. Husbands who abide in Christ are to love their wives just as Christ loved the church. Woe to the faithless husband in the first tale who ignored God’s word. And blessed be the husband in the second tale who was faithful to God’s word. And what of the young wives in the two tales? The wife of the faithful husband is blessed along with him. As to the wife of the faithless husband, she is blessed in spite of him. Indeed, the young, disfigured, no-longer-wanted wife did not despair after her husband abandoned her. Because God was near to her. And He sticks closer than a brother; closer than a faithless husband. The Lord gave the burn survivor beauty for ashes. 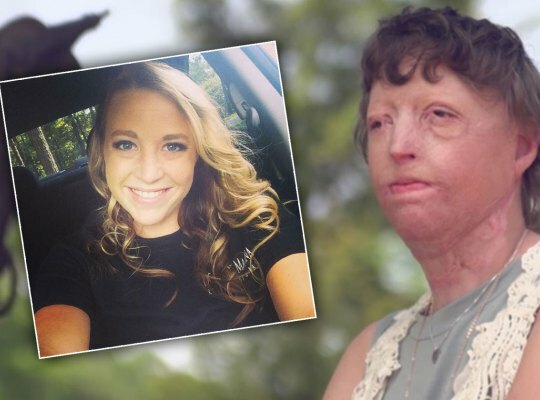 She received an outpouring of love not just from family and friends, but also from complete strangers all around the world..
A GoFundMe campaign has helped pay the medical bills she amassed after more than 20 surgeries. And a Georgia ministry is building her and her daughter a new home – free of charge – on her parents’ property. 29 Jul	This entry was published on July 29, 2017 at 12:01 PM. It’s filed under Marriage and tagged CURRENT EVENTS, GOFUNDME, HUSBANDS, PURPOSE-DRIVEN, RICHARD SELZER. Bookmark the permalink. Follow any comments here with the RSS feed for this post. Older: Is it a Sin to Watch ‘Game of Thrones’?